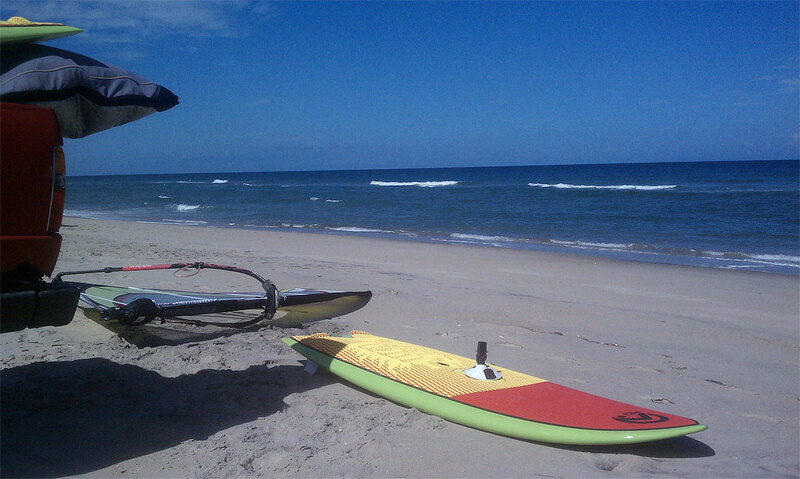 Bill's OBX Beach Life: Introducing the SeaLion PRO to Hatteras! Yesterday I introduced the 2012 SeaLion PRO to Hatteras with a fun small surf session at Cape Point near the Cape Hatteras Lighthouse. Surf was quite small and short period which did not really offer optimal conditions to test the Pro's surfability, but I did notice a definite difference from the Standard in that the Pro felt quite loose yet responsive, and is a definite step even closer to standard wavesailing characteristics on a light air board. The Pro has the exact same outline as the Standard however, volume is shaved from the overall rail thickness bringing it down to 115 ltrs. Weight is also reduced from the Standard which helps improve its responsiveness in the water. The Pro also comes stock with a smaller fin set at 16cm vs 18cm for the Standard. Interested in the SeaLion?! I have SeaLions available for demo/rental as well as a new 2012 Standard SeaLion for sale. Price on the new 2012 Standard is $1195 with pickup in Nags Head. Contact me if interested in either the 2012 Standard purchase or a rental/demo available.